The Human Genome has been Sequenced!! To understand how this is all done, imagine these coils being unraveled into strings, and the molecules spelling out words. The molecules comprise a code of letters, not just eight or ten letters long, but thousands or tens of thousands of letters long. In spite of the very long length of the "word", each of those base pairs are made up of only four different letters: AGCT, which stand for adenine, guanine, cytosine, and thymine, the four bases on DNA. When you sequence a gene you learn the exact sequence of these letters. Obviously it took very sophisticated science to sequence the entire genome. But when you're done, now what do you do with it? 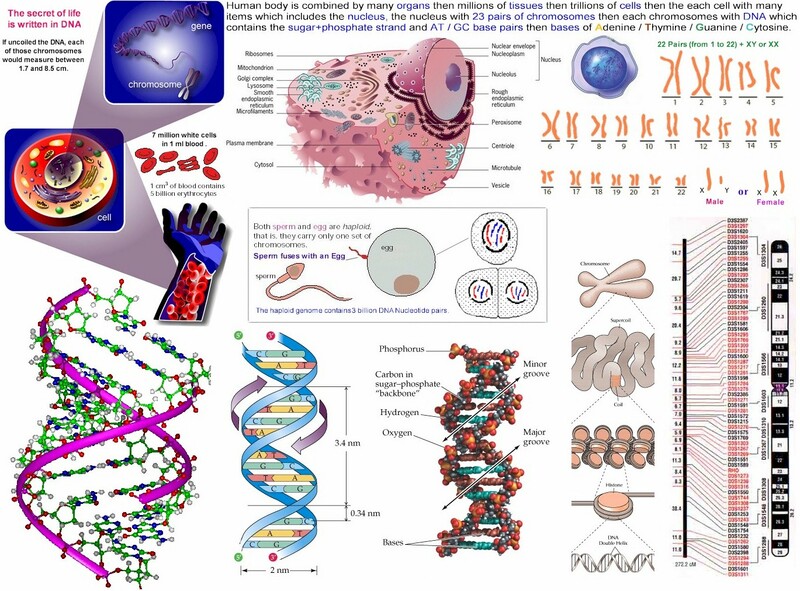 Does it automatically tell us everything about how the genome functions? Very definitely not. T heca thidun dert hec hair. The cat hid under the chair. All we had to do is move the spaces. But in this example, it was relatively easy. We know what a cat is, and a chair, but what if we didn't know? What if we moved the spaces and got a sentence like this one? The snurb hid under the fump. It may look like a sentence, but we still don't know what a "snurb" is, or a "fump". The new buzzword for this annotation process is proteomics. We're going to move from genomics to the protein that the genome encodes. The gene in the cell unravels, and the DNA code makes a messenger RNA code, and in most cases this makes a protein. If all goes well, we get a normal healthy protein. 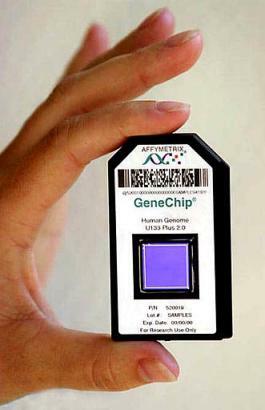 Today the genetic code is sequenced and stored in a small chip.